Ancient Moon - Hekas Hekas Este Bebeloi! Prosternatur - Zi Dingir Isatum Kanpa! Secretum Secretorum is the 2018 split from two enigmatic forces in the European black metal scene, Ancient Moon and Prosternatur. Both bands feature anonymous, or named yet still unknown, members from European countries, with little information known about either project aside from their previously released material. Ancient Moon is a three piece, featuring members allegedly from Belgium, France, and Switzerland. The band’s 2015 full length, Vvltvre, was a suffocating and unsettling soiree into swirling black metal and disquieting ambient, brought to to light across a single twenty-eight minute track. Ancient Moon’s contribution to this split, “Hekas Hekas Este Bebeloi!”, is another lengthy testament to black metal and ambient, though it is delivered in a strikingly different way this time around. A short introduction of noisy, repeated tremolo notes surges forth, ultimately bringing primordial, stomping percussion and throbbing bass notes into the fold as the notes continue forward. Eventually the vocals, what sounds like chants from the early Emperor albums and an underlying scream that is ridden with despair, as the the pummeling percussion and trem notes continue until somewhere around the eight-minute mark, where the tempo changes slightly, slowly losing speed and becoming more ritualistic. This immersive, almost monotonous approach is spellbinding, though not noxious like it was on the full length. This trance-inducing approach makes the rampant blasts and fiery trem riffing at the fourteen minute mark sound devastatingly heavy, though shortly after this happens Ancient Moon deconstructs their sound until handing the reins to the following act. Prosternatur has released no information regarding their membership or origin, aside from the fact that it’s a European project. Abyssus Abyssum Invocat, the band’s debut full length, was released in 2016 and was a dynamic, ritualistic chunk of black metal that, unfortunately, didn’t reach a very large audience. Their three tracks on Secretum Secretorum continue in much the same vein, with a wash of unrepentant, unrelenting black metal. More often than not, the drums blast along while rangy tremolo riffing fires away, though melodic flourishes and nods to ritualistic discomfort are woven throughout. The multi-faceted vocal approach is really cool, with a mix of typical raspy shouts and an ominous chanted style that often blend together into a mystic amalgamation. The abrasive production leaves a little to be desired, as the riffing is quite often muddied under a wall of bass and percussion, but deeper listens allow for a cathartic bloom as the dust settles. From the blistering, acerbic thunder of “Ana Harrani Sa Alaktasa La Tarat” to ritualistic, disquietude of “Usella Mituti”, Prosternatur have delivered three ominously, mystical tracks; clearly carving a special niche all their own. This is one of those split releases where it’s difficult to point out what band is more deserving of your time. 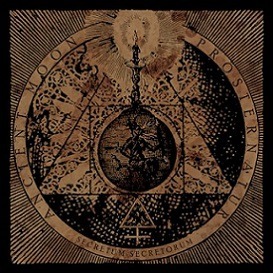 Ancient Moon’s eighteen minute opus of tremolo-infused ambient black metal was a lesson in monotonous immersion while Prosternatur’s abrasive, infectious black metal was riddled with occult mysticism. Perhaps what makes this split so strong is that each band brings their own sense of being into the picture without worrying about what others are doing. In this, Secretum Secretorum stands apart with two bands pushing their own approaches to new levels. This entry was posted in Black Metal, Reviews and tagged ambient, Ancient Moon, black metal, europe, European, Iron Bonehead Productions, mystic, occult, Prosternatur, Ritualistic, Secretum Secretorum.